Billie fought hard to heal her broken heart after Gio chose to marry someone else. When he storms back into her life, she's determined not to fall for his seduction again. This is especially true now that she has a secret to protect...their son. But she hadn't counted on just how badly he wants her back in his bed! nice story, great for passing the time. not one I would call favorite. the Hero was just so mean an arrogant I just did not like him at all, not until the end. 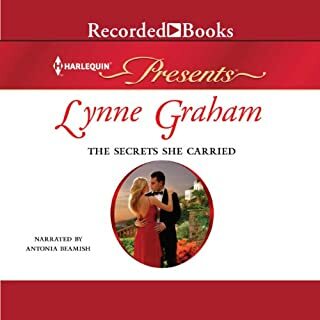 This was one of the better Lynne Graham’s I’ve read (listened to) recently- however, I couldn’t help being distracted by the narrators voice for the male characters. When she voiced the “H”, I cringed every time- it was kind of creepy. I thought her voice was pleasant for the h but flat and monotone and just.. weird... for the H.
I think this one would have been better if there had been dual narrators. It was difficult to get through, in that sense. This is one of those books where you are definitely told the story. The dialogue is minimal, as is the conflict. The narrator did great with the accents, but her male voices are just ok. I sometimes buy the ebook version of these if they sound somewhat interesting. Glad to see they’re included in the romance package. I definitely would not use a credit or pay full price for these.